"After living in the same house for 28 years we decided to move for numerous reasons. 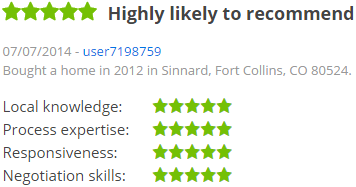 We googled top realtors in Fort Collins, and chose 2 to give us market evaluations, of which Dana Goode was one. After getting the evaluations we had to select which realtor to go with. The evaluations were quite different, as were the strategies for marketing. A hard choice, but we chose right, we chose Dana Goode. "I have had the opportunity to work with numerous real estate agents in the past 10 years. Dana is hands down the best me and my family have had the pleasure of finding a new home with. She was very considerate and paid very close attention to our needs. She made the entire process of finding a new home stress free. Dana took great care to protect our interests and helped us make a great deal on a beautiful home. We loved working with Dana and you will too. If you’re in the market for Real Estate in the Ft. Collins/Loveland/Windsor area you should definitely consider Dana as your real estate agent!" We strongly recommend Dana Goode to anyone who is looking for a real estate professional. Dana is an excellent realtor and a wonderful person. We will continue to utilize Dana’s services based on her extensive strengths." "Dana is the hardest working realtor we know! We don’t think we would have sold our houses so fast without your hard work! Thank you so much!" 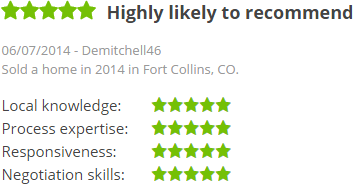 "I have been working with Dana Goode for the past year, to find the perfect home for me in Fort Collins. I met her last June because I was considering a move, but at the time was unsure of how soon I could make the move, maybe not for two years. Dana spent an entire day with me so I could get a feel for the housing market and to view a variety of homes. She took time to get to know me and my needs and gave me a knowledgeable and accurate view of Fort Collins. When I had an opportunity to be in Fort Collins during holidays and spring break, Dana made room for me in her busy schedule and we looked at many properties. She tailored our home tours to my preferences and life style, assuring me that the perfect house would come on the market. She also regularly corresponded with me and sent me many properties to view on her website. She was as excited as I was and no detail seemed too small for her to care about. We found my perfect new home and I am now a resident of Fort Collins. Closing went smoothly because of her efficiency and the respect that she is given from all the other people working in the field. I would describe Dana as a partner, guide, expert, and teacher and someone who places the needs and welfare of her clients above all else. She was honest and I so appreciated her huge knowledge of the many neighborhoods, the concerns and opportunities of the community and her expertise on thinking about things I would not have known to consider. She has my full trust and it was such a joy to work with someone who loves her career, one that she excels at. I will be recommending her to my family and anyone who is considering a home in the area." "As 1st time home buyers, Dana made the process easy to understand and always anticipated our needs. Dana was very conscientious of keeping in contact with us. Dana was super. We would highly recommend her to a friend." "Dana took time to really understand what I wanted. Then she was able to narrow down my search time because she did the preliminary work first. She would tell me about new listings and why I would like them based on my information to her. I would only look at good possibilities. She was patient and energetic. She believed that the right place would eventually come up, and it did!" "We were very pleased with our experience selling a home in a declining market. Dana Goode made the process smooth. Throughout the process Dana was incredibly organized. We were presented with in depth research from the beginning and throughout the selling process. Dana shared her past experience with us in making decisions. Her experience and advice proved right. We felt she was on the job full time giving us advice backed by sound knowledge and experience. There was also room to make our own conclusions and then full support when our decision was made. Suggestions she gave for improvement to the home were reasonable. Originally, she walked into our home and proclaimed it ready to sell but there were a few things here and there to improve that we followed. Then, after many showings and no offers some suggestions from other realtors for our home were passed to us. We made the decision to decline their suggestions and felt her original confidence that the home will sell and it did in three months from its introduction to the market. We were always well informed but not over-informed. When the market declined slightly we were given sound and practical advice for lowering the price of our home. There was always honesty with us as sellers and honesty with potential buyers and then later honesty with real buyers. Our conversations remained kind and always pleasant even in tense times or at times of disagreement. Pricing, home-improvement suggestions, and buyer agreements were practical, honest, and reasonable. Dana was fair and well educated about market trends and wise about solutions. Our experience was professional quality in every way."